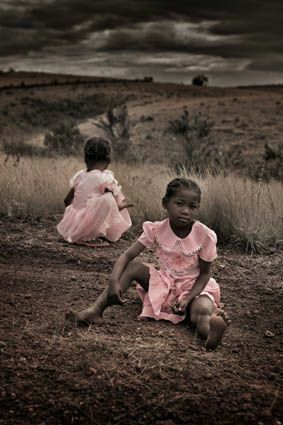 40 photographies of Senol Zorlu are shown in this exhibition - snap-shots of people, that show hauntingly the beauty and drama of the life in Madagascar. The pictures come from a journey through Madagascar during summer 2008 and were shown with great success in Antananarivo, the capital of Madagascar, already in August. Senol Zorlu studied communication design at the FH für Gestaltung in Mannheim. Since his Diploma in 1997 he works as freelance photographer and communication designer. In the winter semester 2008 he began to study educational science specialising in working with streetkids at the PH in Heidelberg. "Between art and documentary, my pictures and portraits show the life in isolated regions of the world. These are fascinating snap-shots of people, which live under difficult conditions." To see these portraits of people, recorded in their living environment, the viwer can experience the way of life in Madagascar. The confrontation with direct eye contact and open posture invites to overcome distances and reflect the socialbility of the population. These pictures allow closeness and you can see many sides of the life in Madagascar. The exhibition "Seventh Continent - Images of Madagascar" is advocated by the embassy of Madagascar and mark the official start of the Noah Foundation.